In case anyone needed a reminder that P.K. 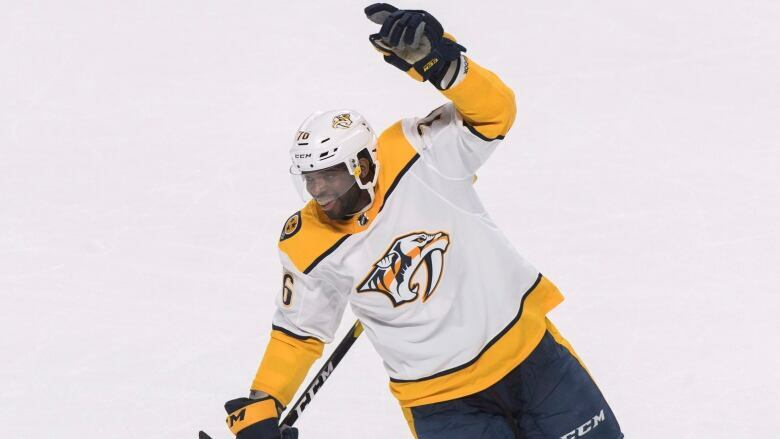 Subban is possibly one the nicest players in the NHL, the Nashville Predators defenceman added yet another act of kindness to an already extensive list of good deeds on Saturday night. Subban, a 29-year-old Toronto native, recorded a video and sent it by text to Ty Cornett, 13-year-old Detroit-area hockey player last week. The teenager's father, Matthew, shared the video, recorded in Detroit during the Predators' visit to the city last week, on Reddit. "In this world, some things happen that we don't really understand. That's OK. We don't have to understand them. All we need to do is understand ourselves, believe in ourselves, keep trying and keep pushing forward. "I just want to tell you that when you're playing hockey, you play because you love the game and you want to play. Let nobody take that away from you." Matthew Cornett says Ty asked for a Subban Montreal Canadiens jersey when he was six and wears the same No. 76 as the player. "This year has been tough," he wrote. "My son is very aggressive and loud, so that brings out the trash talk. I have no problem with trash talking at all [part of the sport], but the racist talk needs to stop. Between the N-word being thrown at him over and over, being called monkey by players and parents, having an entire team beat their chests and act like gorillas whenever he touched the puck. "It's been very tough to hear your son called horrible things. This video meant more to my family than anything. I think my son has watched it over 500 times [no joke]." Subban's social media often involves interactions with young fans, and in 2015 he pledged a $10-million donation to the Montreal Children's Hospital.